Do we have a right to expect everyone to follow the law, but what about our social leaders such as doctors, lawyers, police officers: all leaders? Where these people are likely to make mistakes it is an entirely different thing when collectively people such as the HOUSTON CLAN gather to willfully, deliberately and consciously use this collective power to take from our 2 very elderly parents what was not given to them. They didn’t want to wait for them to die. This CLAN has been given much. Have they had their stumbles and heartache, sure. But, they still had a lot more than most. People in these positions should know that things are not always what they appear to be. Therefore, fact-finding is incumbent upon you. A doctor and a cop don’t know how to find out FACTS? They didn’t because they didn’t want to know the truth, it didn’t fit into their pre-planned agenda. Betraying two elderly people for your own selfish end is reprehensible. People of good conscience must speak up because TRUTH MATTERS. 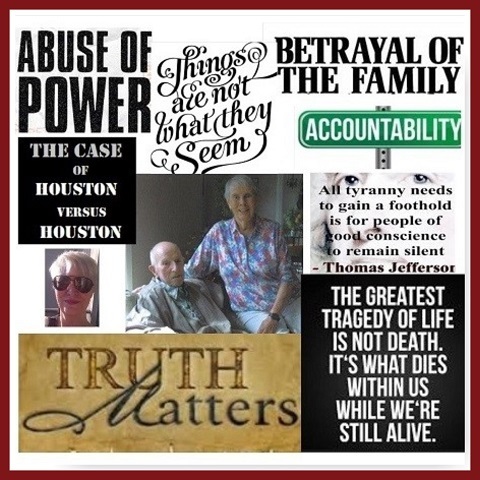 The actions taken by the HOUSTON CLAN robed our parents and myself of dignity and peace of mind. They should have had the right to even understand what was happening to them. Stand tall and stand your ground! You are strong! All I have to do it look to you to see strength, that helps so much my dear lady. Awww thank you my dear! I find strength in your journey, kindness, compassion, and courage. Yes, it does. I don’t know what it means but I have been exposed to the raw side of life but I never realized until a few years ago how much weakness abounds.